More small-format stores, better treatment of employees, and updating existing stores could help the low-price king regain ground. Wal-Mart (NYSE:WMT) has fallen into a bit of a rut. The once-great company has seen digital competitors steal some of its price-driven niche and the online world has even cut into its lucrative Black Friday shopping event. It hasn't fallen so much as stumbled. It's a case of the heights it attained being so great that just maintaining is a challenge. Wal-Mart has not fallen off a cliff, but it has ceded ground and that is reflected in its stock price. That's a rather steep decline following three or so years of upward trajectory. Still, it's not like the retailer has fallen apart. In the second quarter, it posted comp sales at Walmart U.S. that increased 1.5%, while smaller-footprint Neighborhood Market comps jumped approximately 7.3%, with strong growth from new stores. Still, globally "earnings were pressured by currency fluctuations, lower Walmart U.S. margins and investments in customer experience," driving operating income down by 10%. It's not an impossible ship to right, but Wal-Mart's brand does need some tweaks in order for it to move back to growing its stock price. Here's a look at what three Fools think the company must do to get back on track. Bob Ciura (Grow its small-store format): One thing I believe Wal-Mart should do to be great again is to continue investing aggressively in its small-store format. Wal-Mart, through the Neighborhood Markets banner, has finally found a way to penetrate big cities and large urban areas. These are locations it previously couldn't touch because those areas could not offer the chain the necessary square footage to build one of its eponymous Supercenters. But the Neighborhood Markets brand, with each store around 38,000 square feet, has opened up an entirely new demographic for Wal-Mart, and the results so far have been fantastic. Last quarter, the company grew comparable-store sales, which measures sales at locations open at least one year, at the Neighborhood Markets segment by 7% year over year. The figure came in well ahead of Wal-Mart's overall comparable sales, which rose 1.5%. Going forward, the Neighborhood Markets format should continue to be a source of growth for Wal-Mart, because the company intends to open many new stores. It has opened more than 350 Neighborhood Markets in the past two years and plans to open 160-170 smaller stores this fiscal year, compared with just 60-70 Supercenters. Wal-Mart's fundamentals are weak, as sales and profits slow at its traditional Supercenters. But there is a promising catalyst on Wal-Mart's horizon in the form of the Neighborhood Markets banner. 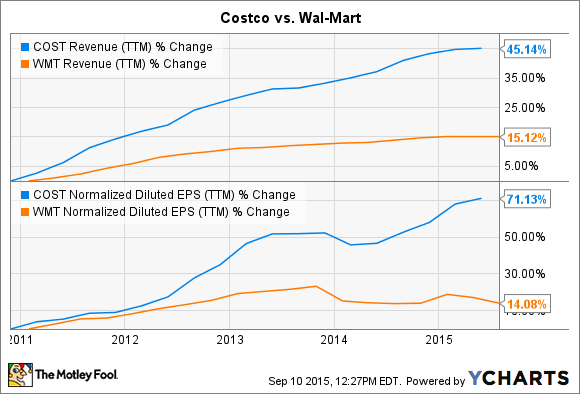 Wal-Mart would be wise to continue building up this high-growth business. Anders Bylund (The Costco way): It seems obvious to me that Wal-Mart should rip a few chapters out of the Costco Wholesale (NASDAQ: COST) playbook. Specifically, the company should start treating its 2.2 million employees to higher salaries, better benefits, and a better work experience in general. Very decent salaries and generous benefit packages have been crucial ingredients of Costco's secret sauce since day one. Fiscal conservatives would argue that Costco is burning cash on an open fire, using up funds that could have been funneled into dividend payouts, building more stores, or simply accumulating as extra cash on the balance sheet. But Costco's generosity attracts a wider range of job seekers, including highly trained professionals who aren't desperate to land the first minimum-wage job they can find. These high-quality workers also stick around longer, creating an army of experienced and knowledgeable partners. They know how to manage and run their stores and supply chains in a way that can't be matched by a steady flow of temporary low-income workers. Earning a living wage without dipping into government handouts or back-breaking second jobs -- now that leads to taking pride in your work and doing it well. In short, Costco's philosophy pays off very quickly. Happy and talented store crews make for well-managed and efficient stores, so customers turn into card-carrying fans. That's good for word-of-mouth marketing, and keeps a solid supply of return customers. Now, Wal-Mart has already started seeing the light. Earlier this year, the company announced modest pay raises for the 40% of its workers who currently labor for the federal minimum wage. There will be more room for career-building promotions, and part-time workers are getting more hours on their schedules. All good stuff. If Wal-Mart can stay the course while accelerating the policies that make a significant difference, I think the mega retailer has a winning strategy on its hands. Daniel B. Kline (Improve the in-store experience): As my colleague wrote, the retailer is increasing its investment in its employees by upping hourly wages in many cases, but its physical stores need improvement. It's a visceral thing, but Wal-Mart stores are simply not as nice as Target stores. It's a question of fixtures, design, and even the age and make of the shopping carts offered for use. Wal-Mart attracts a lower-end clientele not solely because it pushes itself based on offering cheap prices. It simply does not present its brand in-store as well as its rivals do. Even as the chain has added organic groceries and other seemingly high-end items, it has done little to improve the look and feel of its stores and that has to change. Essentially, nobody is making the tired "Tar-Jay" type of reference when talking about a Wal-Mart because there isn't an implied experience of luxury or decadence there. There's also the question of which partners each chooses. Target, in many cases, offers Starbucks locations inside its stores, bringing a whiff of upscale coffee and baked goods to the shopping experience there. In contrast, Wal-Marts often have within their stores a Subway or McDonald's -- brands that obviously lack the coffee retailer's cachet and can contribute to a less savory experience. It's not about adding luxury or putting fancy retail partners inside a Wal-Mart, however. It's about giving the stores a bit more polish to make them appeal to a broader range of customers. It's a subtle change but an important one that could widen the brand's appeal.